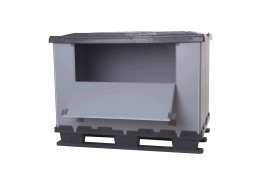 Space saving - foldable transport boxes provide a space saving of 80 % compared with lattice boxes. For products, workpieces, packing goods etc, which have to be stored or transported dust protected. 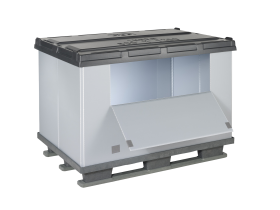 Compactly foldable for storage or empty transport. 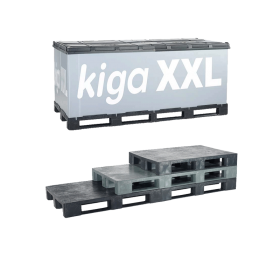 KIGA foldable plastic boxes can be variably combined due to various single parts available. So, the plastic pallet can be delivered e.g. 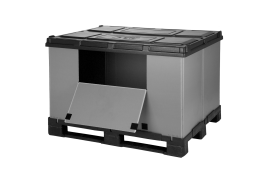 with skids or feet, the foldable frame in different thicknesses with or without loading hatch and with safety locking. Depending on the design of the foldable plastic box we are also able to offer different lid designs, bottom inserts and much more.